Tomorrow from 20.00-22.00 GMT (Monday 29th October) we'll be meeting at the Webheads HQ @ Edunation for another Monday night SL Webheads tour. This time it'll be a visit to some Second Life quests followed by a discussion of how something similar may be exploited for language learning. 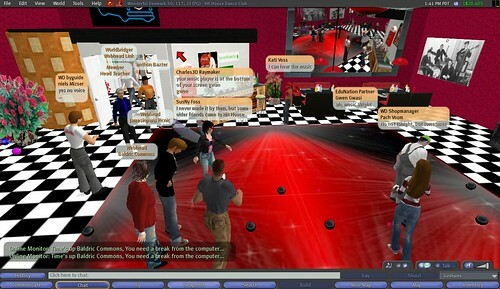 Using Second Life as a platform for games is becoming more popular, with the recent 'CSI' and 'I am Legion' game launches. How feasible is it to do something similar (albeit on a smaller, less ambitious scale) for language learning? So much for being able to keep up a weekly Webheads tour / meeting in Second Life - workload has meant it is impossible, but hopefully a once monthly meet is possible for me to organise. So, after being contacted about this by by Seth Dickens, who is bringing along some colleagues tomorrow, we've decided to restart the tours / discussions tomorrow. What's the theme this time? 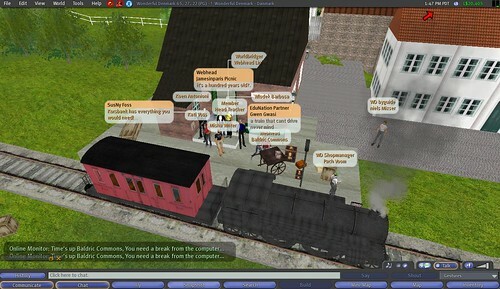 Rather than explore more real life cities (by no means exhausted, however, and I'm sure we'll return to this), I thought it would be interesting to explore some of Second Life's quests and treasure hunts, which offer engaging possibilities for anyone hoping to do something similar for language learning. It's also something that I have researched for the Second Life Teen Grid project I am involved in, and recently revisted the quests on a tour to give some of the other people involved in the project an idea of what we were aiming for. Hope to see some of you there tomorrow! Second Wind for Second Life? 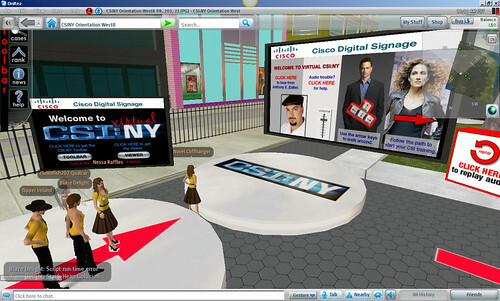 Second Life (SL) seems to be back in the news, thanks to the TV programme CSI:New York, which has featured the virtual world in some episodes and also launched a Second Life game based on the show (see video below). As there are competitions to solve crimes and track down murderers by finding clues and filing reports, it could be interesting to English language learners (I've only just joined in so I'm not sure how valuable it is yet). This transmedia storytelling (thanks to Ewan McIntosh for the link) seems to be something we'll be seeing a lot more of, and Second Life is an attractive option because it is cheaper to build a game using this platform than starting from scratch. It also takes advantage of its existing user base. Could this prove to be a second wind for SL, now that the hype / criticism cycle of the virtual world has slowed down. Another example of this happening is the game that has been made in Second Life to coincide with the launch of the film I am Legion, which looks like a Hollywood version of the film 28 Weeks Later. The Second Life game is "a multiplayer first person shooter / RPG" game, and so is probably not as valuable as CSI is for language learning possibilities. Yesterday's Monday night meeting of the Webheads in Second Life was supposed to be an introduction to the new Webheads HQ @ Edunation III. Eveything was set for 20.00GMT - I was waiting there for people to arrive when the region started logging out (this 'rolling restart' to regions happens occasionally when servers are reset etc.) . I was teleported to another sim and couldn't find my way back for another twenty minutes! Finally, I managed to get back to Edunation, but not to the Webheads HQ, which remained inaccessible for the rest of the evening. Not able to proceed as planned, as people started to arrive, we sat back in the comfy bean bags and chatted, watched a Teachers TV podcast and then Dudeney G demonstrated the fabulous new Flickr in SL tool that he has been developing. How does it work? Well, you can type a tag and then when you touch the too it displays an image from Flickr that has been tagged with this word. We all got carried away trying it out and much fun was had by all. Find out more by watching the Voicethread slide show (below) and by reading the chat transcript below. You can also go and check out the Webheads HQ @ Edunation, where hopefully we'll soon have a copy of the tool that you can play with. Dudeney Ge: Graham - can you hear us now? SusNy Foss: Hi Graham can you hear us? SusNy Foss: Any smart way to see TV screen just in front of my eyes? Dudeney Ge shouts: People outside the glass! Come in!!!!! Dudeney Ge: So, Graham, did you have any plans for the new space? You: what do people think? You: Sus, what do you think we need to put in the Webheads space? You: it uses tags to find the pictures I presume? SusNy Foss: Could you show this now? Norse Writer: btw. 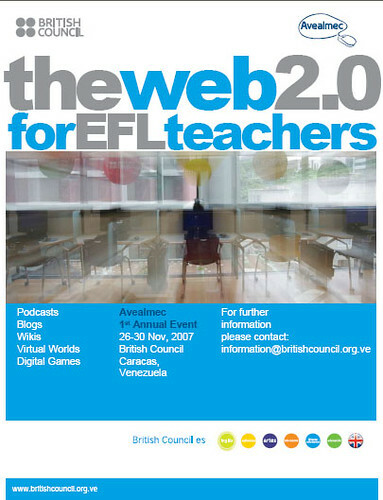 where can i get some more info/learn about how to interface web and SL? Flickr Browser whispers: I don't know what kind of picture to show you. Type '/1 sometag' to tell me what tag to search for on flickr and I'll remember it. SLTweets Hud v0.78: Hello Baldric, ready to Tweet? floor: Please use the laptop keyboard to change slides. SLTweets Hud v0.78: Your tweet has been posted on Twitter.Com. Dudeney Ge: Hmmmm.... results can be .... unpredictable! You: what about explicit content - I mean if you don't want that? Can you set it to only retrieve PG photos? SusNy Foss: hmmm, explicit content - does that mean brutal violence? SusNy Foss: Dennis haning around! Osnacantab Nesterov: Hi, everyone. SL has been down for me. SusNy Foss: which keys could be used to change slides? Dudeney Ge: Keys? As in keyboard keys? Dudeney Ge: That photo doesn't look like Dennis at all! Osnacantab Nesterov: Hey. How did my photo get there? Dudeney Ge: It's quite good, isn't it? Bee Kerouac: how do you do it? Osnacantab Nesterov: How does this marvellous free motive work on the Internet? You: I suppose if there's no image it shows the black screen Gavin? Dudeney Ge: I'm getting 57 FPS - is anyone else lagging hugely? Bee Kerouac: how do you project the photos from Flickr here? Osnacantab Nesterov: I'm seeing 4 black tyres. Bee Kerouac: can I project mine? Bee Kerouac: how do Ihange the tags? Norse Writer: yeah, a realy nice feature. Dudeney Ge: People need a lesson in good tagging! SusNy Foss: this is near my home! Dudeney Ge: I think you're confusing the poor thing! Bee Kerouac: what did you do beforehand? Dudeney Ge: Chatted, watched some Teachers TV, wondered where EduNation III had gone! Osnacantab Nesterov: Do you all prefer typing to talking? Osnacantab Nesterov: I didn't realise sound was on!! Bee Kerouac: anyone wants to buy a puppy called sushi? Dudeney Ge: Dennis - do you hear voice ok? Bee Kerouac: can you have a slideshow on this? Bee Kerouac: how do you call this device? Osnacantab Nesterov: No. I can hear you fine....My wife just came in and reminded me we are leaving early for Berlin. Bee Kerouac: dennis travels all the time ! You: Dennis is presenting SL in Berlin, isn't that right? Osnacantab Nesterov: 3 hours by train. Dudeney Ge: Are you talking about SL, Dennis? SusNy Foss: for which audience Dennis? Is there a demand for studying English in Second Life? In Japan, 30% of those surveyed by Goo Research’s online monitor group would like to. Or at least that's what was said in April this year (I've only just seen this now) - I wonder, if you asked the same people now, would the answer be any different? 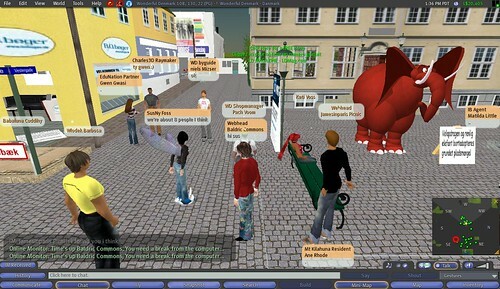 How many of those people have tried to study English in Second Life? And, Perhaps the answer would have been different if they had used a different verb instead of study - learn or practise, for example. I came across the What Japan Thinks survey ("Are you interested in studying English in Second Life?") while trying to find out the source of an extremely annoying error message* that keeps nagging my avatar (see below). Needless to say, I got sidetracked and now find myself blogging about the survey instead of finding the solution to my Second Life problem. From what I gathered, I think most people agreed the idea of supplementing (i.e. 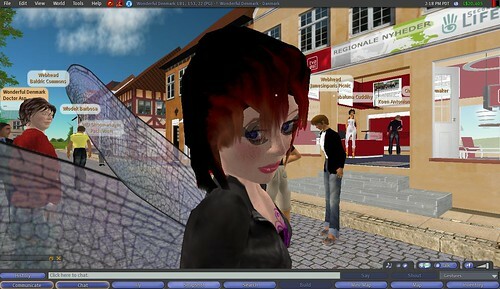 using it for blended learning) is the most probable use of Second Life. 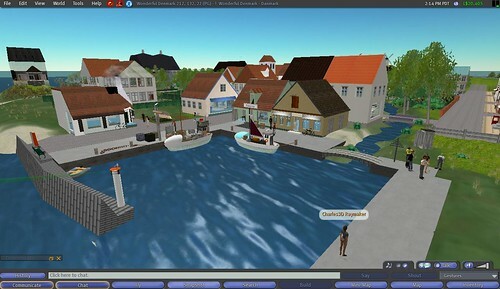 The British Council Second Life project (which I'm involved in), for example, will be using this virtual world as a way of having contact with people the organisation does not normally reach (as well as exisiting customers) , and offering extra resources, events, etc. for learners to supplement face-to-face classes. You can read more about this at my avatar's blog (not much there at the moment, but I'll be posting more frequently from now on). The Second-Life-only company Languagelab.com , however, will be offering courses there (they are still in beta at the moment) , and they have started offering a variety of 'formal, informal and social' ways of learning English. I had the opportunity to take a tour of the languagelab.com islands this summer and was most impressed with the amount of thought and work that has gone into the company and methodology. They also have some very bright minds working on the project, which should show favourable results. 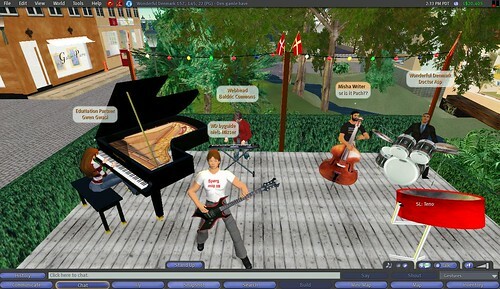 There are also other people that have been using Second Life for teaching language classes, and have gone through some interesting changes in the way their facilities are being used as a result. The English Village is the one that springs to mind, who have changed the way they conduct classes, from imitating sit-down-real-life classes through holodecks and (the latest I've seen) pirate role-playing games. 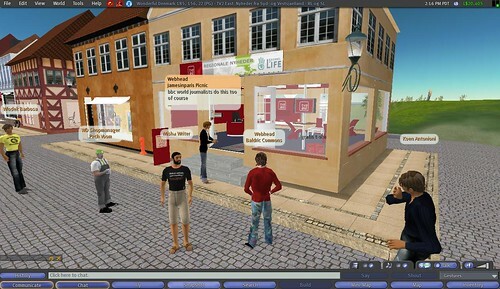 One thing is certain - I'm certain that we're going to see and hear a lot more about language learning in Second Life over the next year or so. For anyone out there interested in meeting up in Second Life on Mondays, I thought it would be interesting to continue the tour of Real Cities we started last week. We only got to visit two, and there are lots more that we can take a look at. As the best part of last week's tour was having a guide speak us through it in Wonderful Denmark, I thought I could attempt to do something similar in..
can you learn about culture from visiting these places? why do people choose to recreate Real Life places in in a virtual world where what you build is confined only by your imagination? Do these places attract native speakers from these countries? Are these places interesting visits for learning the language associated with the cities? What can you learn about culture from visiting these places? I was surprised at the turnout, and after briefly assembling at the Webheads beach hut in Edunation, I handed out a landmark and we headed off to Venice Island. This place is not unique - you can go to another sim called Venice , but here the feel is quite artificial and the buildings are mostly boxes. It's so obviously a quick build by somebody out to try and make money - the lack of love and care comes through and (because of this?) whenever I have been there there's never been anyone around nor a gondola in sight. There are gondolas at Venezia, another Venice build in Second Life, and here the buildings and atmosphere is better. Far more love and care has gone into this sim and there's distinct lack of tacky publicity (which you can find all over the last Venice build). 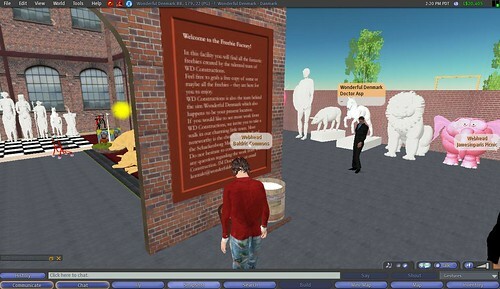 I suggest that a field trip to all three, followed by a discussion might make an interesting discussion activity for learners in Second Life, especially if you ask learners to take photos and write up their opinion in a blog afterwards. 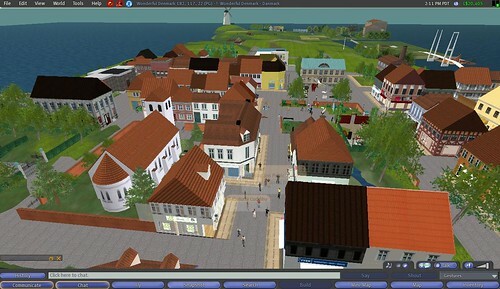 Our guide was fabulous and used a combination of the Second Life voice client and relayed text (not everyone had voice installed) to talk us through the different spaces of the sim, based on a typical Danish town from a popular Danish TV series. It was obvious that unlike the Venice sim, this is a real community of people working together to create something special - there were no shortage of people here, and signs of life everywhere we went : a healthy mix of commercial, cultural and leisure spaces that is obviously being used by many. 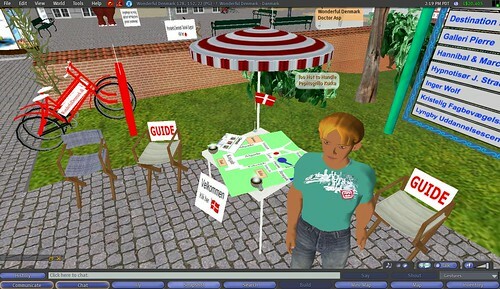 A great example of virtual tourism and it woul also be a fabulous place for anyone interested in learning Danish to head for. I have included the (partial) transcript of our tour below so you can get an idea of the experience, but I highly recommend you go and take the tour yourself. Webhead Link: will you t/p me? You: I didn't think so many would come! You: are we going to use text or can we use voice too? Webhead Link: what do we have to do to use voice? You: if I speak and you don't have the voice client installed does that mean you can't hear me? Webhead Link: how do you get it going? Misha Writer: oops - headphones on then! You: Shall we start with our first city? Wlodek Barbosa accepted your inventory offer. Webhead Link accepted your inventory offer. Kati Voss accepted your inventory offer. Charles3D Raymaker accepted your inventory offer. SusNy Foss accepted your inventory offer. Misha Writer accepted your inventory offer. Gwen Gwasi accepted your inventory offer. Babaluna Cuddihy accepted your inventory offer. You: ok, shall we go? Koen Antonioni accepted your inventory offer. Kati Voss declined your inventory offer. You: let's take a look around and then meet here in say 5 minutes? Koen Antonioni: can we have voice here? Misha Writer: can we all get in? SusNy Foss: Baldric, I have made an appointment with some Danes - we can meet now - I AM sailing! You: you got it to work sus - well done! SusNy Foss: Oh Kati, how romantic! Kati Voss: where are you from, Sus? Misha Writer: can you rt click & sit? Jamesinparis Picnic: hi do you have mike's active or are we just text chatting? Jamesinparis Picnic: i might well get lost... how do we travel? Charles3D Raymaker: this sim seems pretty popular, is it mostly our party? Babaluna Cuddihy: do you think those cities would attract people in sl to learn another language? Jamesinparis Picnic: ok we just click on the slurl right??? Charles3D Raymaker: where are we going next? Ane Rhode: Det er bare dig som gør det Jose..
Josephine Planer: hvad gør jeg?? SusNy Foss: oh - what a crowd! SusNy Foss: ok - Niels will speak Danish I I'll translate! Gwen Gwasi: who knows danish? SusNy Foss: Can we start now? Liv Cioc: hvad går du og laver? Matilda Little: whos talking everyone ? You: I think the voice has been turned off in here, is that right? Cobalt Motors - 59' Kaddy Kruiser: Anti-Theft system activated. Enjoy your flight. SusNy Foss: Many Danes meet here, right Niels and Pach? You: do you find anyone here trying to learn Danish? SusNy Foss: Korsbaek has everything you would need! Jamesinparis Picnic: it's a hundred years old?. Misha Writer: was that the train puffing? SusNy Foss: I am sitting in tge train! Babaluna Cuddihy: well what interests me is -do you think those replic placesa atttrac people more then other sl places? Charles3D Raymaker: more than fantasy places you mean? Babaluna Cuddihy: yes its lovely! You: do you get sponsorship from the companies? SusNy Foss: Niels, who sponsored this, do you know? Door: SusNy Foss is at the door. Koen Antonioni: this is interactive audio I assume: triggered by our presence? Jamesinparis Picnic: sus is here..
You: susny - love the way your name is pronounced! Babaluna Cuddihy: is it mostly commercial area or also residential -anybody knows? Jamesinparis Picnic: a unino like a trade union? SusNy Foss: And they are sponsors? Babaluna Cuddihy: are y promoting it in rl to make the join sl -Doctor asp? Jamesinparis Picnic: why is it typical? the fishing boat? Jamesinparis Picnic: Fisheauktion is where the catch is sold? SusNy Foss: This is a great place for learning! Second Life: Items coming in too fast, automatic preview disabled for 10 seconds. Misha Writer: most of your visitors are English speakers? SusNy Foss: I already have a hoge horse now I also have a cow! Babaluna Cuddihy: are ther danish courses as well here? CJ Tomorrow: er skin også nyt? Wlodek Barbosa: Thank you! This place is GREAT! Misha Writer: well I'm playing this double bass but I can't hear any music . . .
Misha Writer: is it Niels? Misha Writer: or is it Pach?? Jamesinparis Picnic: thank you and Niels for this great tour! The Interactive Whiteboard - white elephant or teacher's pet? The Interactive Whiteboard (IWB) is a technology that promises to truly transform the classroom and yet is seen as a threat or a waste of money by many teachers. Their views range from luddite, regarding the introduction of any teaching technology as unnecessarily contaminating the classroom to the (more reasonable) preoccupation that this tool will lead to a overly teacher-focused environment and a group of learners passively sitting dazzled by the bells and whistles used by the sage on the stage. It doesn't have to be that way though. In this post, I will reflect upon the recent discussion on the Dogme (teaching unplugged) list about the pros and cons of IWBs, and put forward the view that the key to a successful IWB implementation is in the training, something which seems to be missing when many organisations unpack and install these shiny new toys. Before I continue, let's stop and take a look at the tool itself. There are many different types of IWBs, but features are similar (consult the Wikipedia entry on Interactive Whiteboards for further details). The market leaders at the moment are Promethean, Smart and Mimio. These manufacturers make IWBs which have similar features (but with some important distinctions) but it is important to note that the software used by each company is not compatible. Thus, the first important decision to make before buying is which one to choose. Smart technologies seems to have been around the longest and is very common in the USA, and this is why many people still call IWBs Smartboards, but this is the equivalent to calling a vacuum cleaner a Hoover. Promethean appears to have gained more ground recently and is very popular in the UK and Australia. The British Council (my employer - I should declare now that I have a bias for Promethean boards because they are the ones I have used the most), for example, is installing ACTIVBoards in many of their teaching centres around the world. Mimio seems to have become popular of late because they offer the possibility of turning regular whiteboards into IWBs, thus being a lower cost solution. I have no direct experience of the Mimio system, but I do know colleagues who have tried it and were not that impressed. Apart from the hardware, careful attention should be paid to the software, how it works and how it is supported. This is the key to IWB functionality and makes the big difference between using an IWB or a data projector (beamer) and a standard whiteboard. Most IWB software works like a combination between a graphics package and presentation software (e.g. Powerpoint). Certainly, teachers who have used graphics software before have a much easier time than those who haven't. What differences are there between software? Much is down to look and feel, but, for example, you can write on a smartboard with your finger, but need a special pen to write on a Promethean ACTIVboard. Software support is important too: Promethean, for example, offers online training and accreditation and a user site, Promethean Planet, whose forums (where teachers share resources, tips and ideas) are second to none. An important reason why the British Council chose the Promethean IWB system was because the licence includes the ability to install the software on their home computers (so they can plan from home) and a free student version (view only) which means they can review flipcharts (what the Promethean IWB created materials are called) at home. The discussion on the Dogme (teaching unplugged) list began when Scott Thornbury appealed to its members for "ammunition" after calling the IWB an 'interactive white elephant' during a conference in Brazil. produce a more frontal style of teaching, and consequently fewer opportunities for genuine interaction." I think this is true if teachers are let loose without any training on how to use the IWB effectively. One of the ironic things about the IWB is that although it resembles a tool that is familiar to all teachers, it requires a sea change in methodology if it is to be used optimally in the classroom. Of course, you can use it in the same way as any other (black or white) board (i.e. by walking into class and writing on it without any prior preparation), but this is akin to using a truck to drive to the corner shop for groceries and coming back home with a bottle of milk and a tin of baked beans. Strangely enough, writing on an IWB during class time takes longer than on a regular whiteboard, and you'll probably not be able to fit as much on the board. And as for those teachers who are used to sectioning a board with part for class agenda and space for vocabulary? This is a waste of space and time on the IWB, especially as you have unlimited number of pages to flip back and forth through whenever you want. And there's no need to make students wait while you write something from a coursebook on the board - you should have done that before the students even entered the room. Breaking old teacher habits that have no place and make no sense when using this tool is as important as experimenting with new ways of using it. It should come as no surprise that training and practice are the keys to using the IWB effectively. The interactive whiteboard is not cheap technology, but this is one of the hidden costs. Another is a need for increased technical support in situ, but as far as learner impact is concerned, the sure way to drive a stake through the heart of an IWB project is to try to cut costs in training. But, because it looks like a reglular board, there is a temptation for organisations to hand teachers a pen and let them get on with it. This results in the learners losing out. Back to the Dogme discussion . Browsing the other posts written by members of the Dogme list about IWBs, it becomes clear that some of these teachers have had as much experience of and interest in using an interactive whiteboard as Paolo Freire had of playing with a Nintendo Gameboy. Then there are others that have formed opinions based on observing sales reps. giving ten minute demonstrations of the technology at conferences. The negative "seems to be used for presenting grammar mcnuggets" view is hardly surprising given the kind of ELT publisher materials available I suppose. Only one or two of these people seem to have based their opinions on actual teacher observation (albeit cursory observation, i.e. saw a teacher through a window...). And most interestingly, those of us who have actually used an IWB were positive about the potential. So, what was the result of all this debate? I'm pleased to say that some of the Dogme die-hards have been prompted to take another look at the technology. And if we can persuade organisations to invest more in training teachers how to use the interactive whiteboard well, then this will do a great favour to teachers and learners who find themselves having to use it. Will all teachers have to use one in the future? Who knows? I have started to see "experience in using an IWB" appearing in some of the job advertisements for teachers, and I think we will see more of this in the future. So long as the potential of this fabulous tool is not wasted by misuse and methodological abuse.